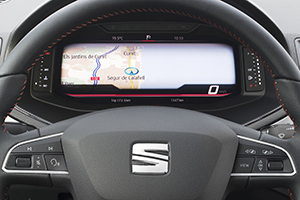 SEAT is bringing its versatile and customisable Digital Cockpit to the Arona and Ibiza, providing clearer information that is better suited to individual drivers. The SEAT Arona is the first crossover on the market to benefit from the 10.25” interactive, customisable display, which has already aided drivers in the SEAT Leon and Ateca since January 2018. In the UK, the Digital Cockpit comes as standard in XCELLENCE Lux and FR Sport trim for Arona, Ibiza, Leon and Ateca. The pixel-dense digital instrumentation not only has a more modern and versatile design, but provides greater functionality, allowing drivers to view everything from classic information found on analogue dials, such as speedometer and tachometer, to full-colour maps and navigation (as optional equipment). Controlling the information provided is simple and requires the driver to merely press the steering wheel-mounted ‘View’ control button to scroll through the three different available main displays, minimising driver distraction and maximising the clarity of information provided depending on the driver’s needs. Transitions between the available information on the 1280 x 480 pixel TFT display are smooth thanks to its 75 Hz refresh rate, which makes information easier to read. SEAT’s Digital Cockpit provides three main information displays: Classic, Digital and Dynamic View. Classic information provides the well-known analogues features such as a speedometer and tachometer, but between these two digital dials extra data can be displayed, including navigation information, music, phone, driving data and assistance information (lane assist, blind spot detection and front assist, ACC) and your vehicle’s status. While additional information can also be displayed in the very centre of the dials. Digital maximises the 10.25” Digital Cockpit’s pixel dense display, showing detailed mapping information for the vicinity you’re in, making it easier to find parking facilities, garages and follow directions. The map can be zoomed in or out to make it easier for the driver to orientate themselves. This view also provides all menu information, such as phone, driving data, assistance information and vehicle’s status. The Dynamic display provides an improved clarity to important information such as turn-by-turn directions, advanced driver assistance system information from lane assist, blind spot detection and front assist, and your vehicle’s status. Driving data can also be displayed in all views, including: fuel consumption, distance driven and total mileage. The system also allows you to show the music currently being played, while the driver can scroll through the music library with minimal need to take eyes off the road. And in a world that is constantly connected, should an incoming call be received the display will automatically adapt to include the caller’s ID, with the person appearing as a ‘pop-up’ on the screen. The customisability of the Digital Cockpit means that no matter who is behind the steering wheel, the best information for that driver will appear. Two of the main displays – Classic, and Dynamic – can be adapted to show specific information. This means that if the driver wants to mix navigation indications with traditional speedometer and tachometer dials or use the full screen to display the detailed map it can be saved as a user profile and easily selected the next time the driver is behind the wheel. Up to three profiles per style can be created and saved in the system. On top of that, the Digital Cockpit features light sensors which, depending on ambient lighting conditions and by way of an algorithm, adapt the display lighting of the vehicle's screen displays. The Digital Cockpit is an instrument cluster that has been designed as an interactive display which is why it can be configured to the driver’s needs. And with a resolution of 133 dpi, the increased clarity and breadth of information available puts drivers in greater control. If those are the fully hot engine oil pressure figures they are fine. BTW. The thread for the oil pressure gauge on my (AEB) engine is M10 x 1 mm.